Wow! Unlimited Data Plans available. When you bundle Exede Satellite Internet with DIRECTV, you save $120 off your Exede bill the first year! Get incredibly fast Exede Internet speeds along with the amazingly loaded DirecTV channel lineup. Experience the best of both worlds! Exede Satellite Internet offers up to 12 Mbps download speeds and up to 3 Mbps upload speeds. Get access and do what you want in no time! 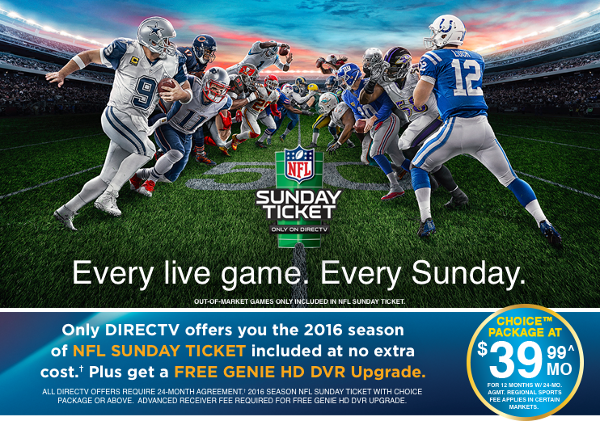 Along with a great channel lineup, DirecTV offers the 2016 NFL Sunday Ticket - all the live out-of-market games every Sunday. Now everybody's happy! Exede Satellite Internet and DirecTV are here to save you time and money. Get the bundle and Save! If you already have DirecTV you can get Exede Satellite Internet. Don't miss out on the great offers!